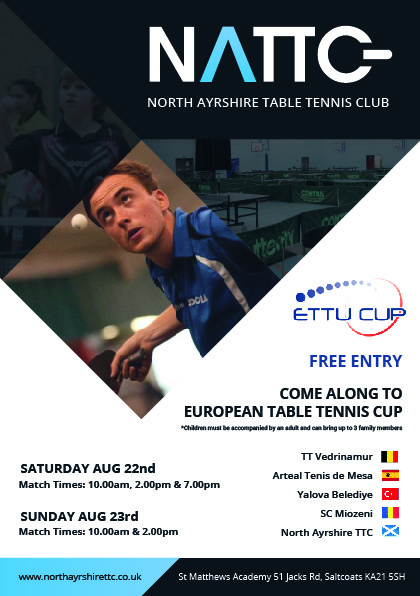 Teams from Belgium, Romania, Spain and Turkey will be travelling to Scotland next week to compete in Round 1 of the ETTU Cup at St Matthews Academy, Saltcoats. Our North Ayrshire team of Chris Main, Colin Dalgleish, Richard Main, Andy Macpherson & Chris Barclay will be up against top sides from the above countries in order to qualify for the 2nd round. This is the most prestigious club competition in table tennis and will see top European players head to our home venue in Saltcoats to battle it out in a round robin format. North Ayrshire team are 5th seeds, however we hope having the home advantage & support that we can cause an upset and string together some unexpected wins. Matches on Saturday are at 10am, 2pm & 7pm. Matches on Sunday are at 10am & 2pm. A team match will last around an hour to 90 minutes and we encourage all spectators to arrive at least half an hour before the match time to see the teams walking into the court to the sound of bagpipes. The 7pm match on the Saturday evening is being billed as the main event which will see North Ayrshire play Turkish side Yalova Belediye. As part of our promotion in the three towns area, we will be handing out over 2000 free tickets & flyers to local schools, youth groups & community centres to encourage and let everyone know that this is an event not to be missed. Entry is free to all sessions making this a great opportunity to witness top class table tennis, so make sure you’re there supporting the club in this prestigious event and enjoying the entertainment that is on offer throughout the day. Please note that u16’s must be accompanied by an adult. Please park your car at the KA Leisure sports & community entrance of the school, however, please note that car park will be busy as other activities are on through-out the day. If invited to the drinks reception for the 7pm match, please park at the school entrance and enter the school through the main entrance where you will be greeted by one of our club committee. Programme’s will be handed out on the day and a shop will be open with all the necessary food & drink items available to buy. Flyers and information sheets will be able to pick up and take home with details of the classes we run and what activities are on offer. As one of our older members stated last week “To anyone who doesn’t know what top class table tennis looks like, just imagine it on steroids then times it by 10″.